Motorcycle holidays don’t have to be epic journeys down route 66 or riding across India; you can enjoy the thrill of biking abroad much closer to home by taking a trip through France. Whether your passion is the latest touring bike, a vintage classic or an old favourite you’ve spent hours tinkering with, France has the fantastic scenery, quiet roads and friendly people that will make your biking holiday really special. 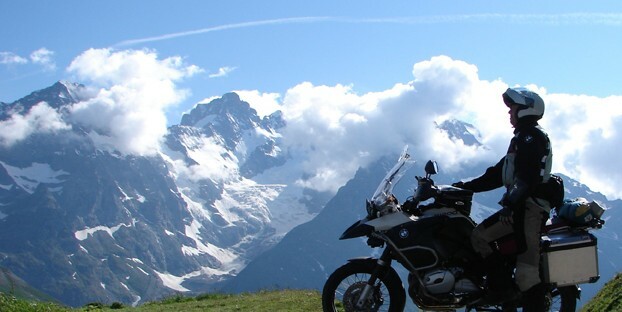 Roger Nicholls, owner of 3 holiday cottages in Brittany and motorcycle holidays specialist, gives us his top tips and words of advice for a perfect biking holiday in France. There are some important differences when driving in France, most notably the fact that you need to drive on the other side of the carriageway! This can be harder to remember for bikers than car drivers so many choose to tie a ribbon or put some tape on their left hand mirror as a visual reminder. There are also some unique rules on right of way that may mean even on some of the more main routes you need to be very aware of people pulling out from side roads onto the main carriageway – where this applies, the rule is “give way to the right” so even if someone pulls out right in front of you it will be your fault if you hit them. Remember it is a legal requirement to carry spare bulbs, but as of 1st July 2012 every road user must also carry their own breathalyser! Don’t worry if you don’t have one yet, they should be available nearer the time from most ports and embarkation points for between £1-2. It is compulsory for motorbikes to use dipped headlamps day and night, and from 1st January 2013 it will be compulsory for motorcycle riders to wear reflective clothing with a reflective surface of minimum 150 sq.cm (23 sq.inches) – with fines for those not complying. Be very cautious and vigilant and watch your speed when junctions are ahead. Speed limits in France are 50km/h (31mph) in built up or residential areas and this applies even in villages where no speed signs are displayed. Motorway speed limits are dependant on the weather with 130km/h (81mph) permitted in dry weather and 110km/hour (68mph) in the wet. There are numerous radar speed traps in operation and speeding carries immediate fines so you may be taken directly to a cash point to pay up. Being from the UK won’t exempt you from payment and fines of up to €60 are common. If you are caught exceeding the limit by a significant amount you may even get your bike impounded and have to pay to get it repatriated and yourself home. Drink driving (anything more than a single spirit measure, small glass of wine or small beer) will also result in your bike being impounded and repatriation in the case of police impounding of your vehicle will not be covered by your insurance. 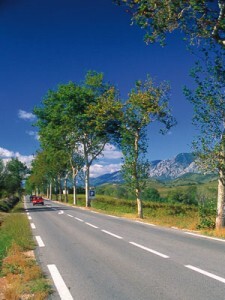 Planning your route is very important to get the best from your trip to France. Modern touring bikes are more than suitable for long road trips, but if you are using vintage bikes or you wish to take a longer holiday or explore the further reaches of the south of France and Spain you might want to consider taking a van or trailer. This will allow you to bring more luggage and reach your chosen ‘base’ more quickly and easily. When planning your route or daytrips out you should not expect to cover more than 350km in a day by motorbike, but the distance you cover will obviously depend on your route and the type of bike you ride. Sat-nav can be useful but you should remember that many rural roads may not be in the system and often the most direct route is not the best for bikes or scenery. Remember – the best roads to ride in France are usually the minor routes and there are often D roads running alongside major motorway routes that are quieter, toll free and offer better scenery and insight into the French way of life. Online forums and bike magazines are great places to get advice on routes from those who have already travelled them. Research before you go and don’t forget to plan for lunch! Many restaurants, especially in rural areas, only serve lunch between 12 and 2pm and at other times you’ll have to rely on ubiquitous fast food joints – hardly a way to enjoy the best cuisine France has to offer! The new unleaded petrol containing 10% Ethanol is available (labelled “SP95-E10”) – however this may not be compatible with some bikes, so ensure you check compatibility with the manufacturer before using as it degrades seals and hoses made from conventional rubber. There are many automated petrol pumps in France, which can be used even when the petrol stations are unmanned – but be aware that some UK credit or debit cards may not be accepted. Make sure you factor in estimates and timings for getting petrol, you don’t want to be caught short in the middle of nowhere! If you break down, your insurer should be prompt in repairing or repatriating your bike (check the level of cover for foreign travel before your holiday) but if you are staying at accommodation that caters for the biking community you’ll often find the support, skills and parts to get back on the road on site. French roads can be a joy, light on traffic and the drivers there have respect for bikers and often let them pass. The French in general have a great affection for motor bikers that we don’t have here in the UK because the historical link with aggression is just not there. There is even an annual rally in Rennes each August called “Madonna des motards” where thousands of motorbikes and riders convene in order to receive a blessing and remember bikers who have died. Unfortunately the French roads can also be perilous, particularly during repairs, which are not always clearly signposted and often use basic methods of laying down tar oil and covering it with loose gravel even on D roads. This combination is potentially lethal on a bike and can result in nasty accidents for even experienced bikers. You should also watch out for mud and loose material on roads in farming areas, particularly at harvest time. The same principles apply whatever country you are in, motorbiking can be dangerous, but it’s also exhilarating, exciting and for some a way of life. Just be aware, be prepared and drive at safe speeds for a successful holiday. Plan your route, remember to factor in petrol stations and food stops, alternatively take a guided tour that will have all this covered. Drive on the right hand side of the carriageway! Remember to keep a drink handy on long journeys; it’s easy to get dehydrated especially in warmer weather. Go in a group, or make new friends on the road, it’s a sociable way to travel. Enjoy France! Make sure you get to see the sights and experience the food – after all you won’t be able to bring back many souvenirs travelling by bike, so make those memories good ones! i have heard it’s illegal to speed camera detection on your Sat Nav, please can you tell if this is true and if so is it acceptable if this function is turned off. Andi if you are travelling after 1st of july you will need to carry a breathalizer kit – approx €2.20 for a box of 2. This a legal requirement after the 1 July. Mark your left hand mirror with tape or a stick on dot etc. this will help remind you to stay on the correct side of the road. It’s very easy to forget on a bike especially at road islands and junctions. Take great care of radar and hidden speed traps. The temptation to blast down a seemingly clear straight road is very tempting, stick to the limits as on the spot fines are used. Drink limit in France is one small glass of wine and random breath testing is frequent and at any time. I took a group of bikers out two weeks ago at 5 pm and we were stopped on a small road and each of us was breathalized . Have a great trip and enjoy the beauty of France and the freedom of the roads. Do not pay bumped-up prices in the UK for breathalysers – they cost very little in France as Roger says above. Also, always make sure you have 2 on you – this means that if you have to use one, you still have another in reserve to produce to the Gendarmes! Hi Do bikes need to carry a Warning Triangle. Also do we need to alter headlight beams for driving on Right as many manufacturers say tape can damage headlights. Please can someone tell me if a motorcycle/motorcyclist is required to carry a warning triangle and Hi Vis vest or 2 vests? We have a fleet of 14 GT motorcycles (Honda Goldwing, BMW K1600 GTL, BMW R1200 RT, BMW R1200 GS). We offer rentals and tours for individuals and groups. – you don’t have to carry spare bulbs, nor a breathanalyzer. I confirm that no spare bulbs are required, and reflective clothing are not required. No breath analyser as well. The roads with speed cameras are those which are busy. There are only a few off these main roads, where it is much more interesting to ride. You can get free GPS tours files on http://www.moto-plaisir.fr, and you can rent a bike from there, with everything you need for a great trip. There are cheap flights to Geneva, and you can get the bike right from the airport. Based in Cannes, Columbus International offers the largest selection of BMW, Ducati, Harley Davidson and MV Agusta rental motorbikes in France. All our motorcycles are the latest models and permanently serviced to the highest manufacturer standards. An unlimited mileage allowance and fully comprehensive insurance come standard. For added convenience, we deliver and pick-up your hire motorcycle anywhere within 200km of Cannes. This covers Nice and Marseille. 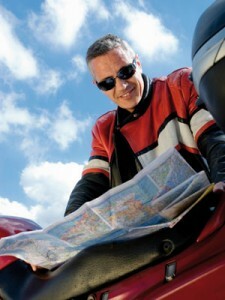 What’s more, bikes can be fitted with GPS including a selection of our favorite riding routes. Please visit our website http://www.columbus-international.com/ for further information. Any questions? We promise to answer any enquiry the same working day. I was looking for motorcycling holidays i have searched many sites to get best information.I founded such a great information in you website thank you for sharing. Hi there. Great reading all the tips etc. I’m going over for my first trip on the 27 th April . I’m on my own as I don’t have any mate with bikes. I recon I’ll stick to the coastal area, Calais downward.. Must admit I’m bricking it a bit. Don’t know why, been a land distance trucker for years. The gold wing is in getting belts, tyres and various other things done including a major service this week and next. Can’t wait. Will go south for four days then back via a more inland route. Any ideas are most welcome. It’s worth noting that from 1/1/16 it is compulsory to wear motorbike gloves in France too. (I know most of us do anyway but there are some who don’t!). Good article but needs some updating now as rules can change in France quite quickly! From 01/01/16 it is now a requirement to wear motorcycle gloves.